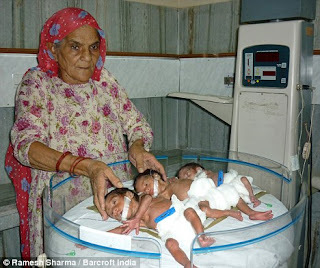 June 14, 2010 - After nearly 44 years of a childless married life, a 66-year-old woman in Haryana has given birth to triplets, becoming possibly the oldest woman to do so. Bhateri Devi gave birth to the triplets – two boys and a girl – May 29 at National Fertility Centre here through In-vitro Fertilization (IVF) technique, officials at the centre said Sunday, adding she was possibly the oldest known mother in the world to give birth to triplets. According to the birth certificate issued by a government hospital in Rohtak district, Bhateri Devi was born on May 21, 1944 in Madina village of Rohtak. This birth proof is authentic, and therefore she has become the oldest mother in the world to give birth to triplets so far, Anurag Bishnoi, who supervised the whole process, told reporters. In this completely updated and expanded edition, Shannon identifies the specific nutrition and targeted supplementation can be used as self-care to overcome cycle problems or improve fertility.